Scientists estimate that the largest blue ever to have lived probably weighed more than 200 tons -- 400,000 pounds -- and was more massive than an entire herd of thirty African elephants. A truly impressive beast, indeed. Blue whales dwarf even the largest dinosaurs, being nearly twice the size of the largest prehistoric land dweller Brachiosaurus. A small child could crawl through the chambers of a blue whale's immense heart, or out one of its twin blowholes. Scientific accounts cite individual blue whales nearly 100 feet in length while less reliable whaling records reported giants up to 110 feet long. 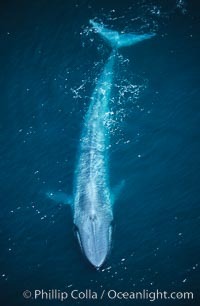 The largest subspecies of blue whale, intermedia, inhabits Antarctic regions while the slightly smaller musculus is found in northern hemisphere oceans.